Tumor Markers in Detection of Lung Cancer. Advances in serum protein electrophoresis. Aspirin resistance: A review of diagnostic methodology, mechanisms and clinical utility. Tumor-associated carbonic anhydrases and their clinical significance. Mitochondrial disease: maintenance of mitochondrial genome and molecular diagnotics. Microfluidic Enzyme-Linked Immunosorbent Assay (ELISA) Technology. Pathogenic mechanisms of anti-endothelial cell antibodies (AECA): their prelevance and clinical relevance. 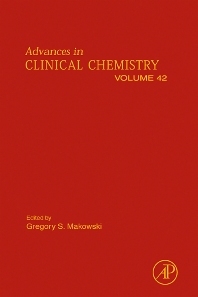 Volume forty-two in the internationally acclaimed Advances in Clinical Chemistry series, contains chapters submitted from leading experts from academia and clinical laboratory science. Authors are from a diverse field of clinical chemistry disciplines and diagnostics ranging from basic biochemical exploration to cutting edge microarray technology. In keeping with the tradition of the series, this volume emphasizes novel laboratory advances with application not only to both clinical laboratory diagnostics, but as well as practical basic science studies. This volume of Advances in Clinical Chemistry is an indispensable resource and practical guide for twenty-first century practitioners of clinical chemistry, molecular diagnostics, pathology, and clinical laboratory sciences in general. Clinical chemists, pathologists, medical technologists, and researchers. Dr Gregory S Makowski is a board certified clinical chemist and fellow of the National Academy of Clinical Biochemistry. Following receipt of his PhD in Biochemistry from the University of Connecticut Storrs, he pursued post-doctoral studies at the University of Connecticut School of Medicine in Farmington that culminated in his joint appointments in the School of Medicine and the Department of Laboratory Medicine at John Dempsey Hospital. He has numerous clinical and basic science publications and serves on various scientific and editorial boards. He is actively engaged in the training of Pathology residents and fellows in the Department of Pathology and Laboratory Medicine at Hartford Hospital. He currently serves as Vice President and Chief Scientific Officer for Clinical Laboratory Partners in Newington CT, USA.